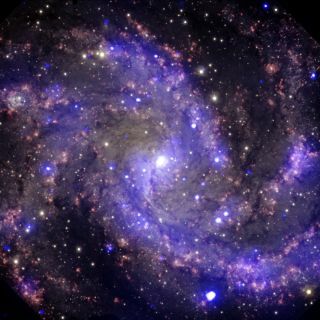 Nicknamed the "Fireworks Galaxy," NGC 6946 has had nine supernovas observed within it over the past 100 years. It is the site of SN 2008S, a puzzling supernova. A star thought to be responsible for the puzzling supernova SN 2008S may have been falsely accused. Following a spectacular explosion in the so-called Fireworks Galaxy, astronomers rushed to identify the source, settling on a likely star. But new research reveals that the star in question may be innocent after all. If the explosion came from a massive supernova, the star responsible would have been obliterated. However, after taking a new look at the region of the explosion, astronomers have found that the object tagged as the source, or progenitor, is visible once again. "If the thing that had been reported as the progenitor was actually the progenitor, the star would have had to blow up and die, but then go back to the pre-explosion flux — which doesn't physically make sense, because the star is supposed to die," Benge said. At the end of its lifetime, a massive star will explode in a fiery death known as a supernova. The explosion produces a bright light, which can be visible with the naked eye, and sends astronomers scrambling to study the brief flare-up before it fades beyond the limits of detection. On Feb. 1, 2008, an explosion in NGC 6946, known as the Fireworks Galaxy due to its high supernova count, caught astronomers' attention. At first, the object was classified as a "supernova imposter," an explosion that looks like a supernova but has no apparent source when astronomers look through historic optical images, suggesting something else is responsible for the flare-up. After looking at the system at infrared wavelengths, which let researchers peer through dust that blocked visible light, scientists identified a star in the same location as the supernova and determined it was the self-destructing culprit. But Benge and her colleagues weren't quite certain that the star was guilty. Using the Spitzer and Hubble telescopes, they compared the difference in the amount of light in images from the region both before and after the explosion. Not only did they find the alleged source present once again, but they also found that it put out exactly the same amount of light as it was producing before the explosion. This finding suggested two possibilities: Either the dramatic brightening observed in 2008 wasn't a supernova at all but instead a strange stellar flaring, or the convicted star wasn't the source. The astronomers studied how the light evolved over time and compared it to the best-studied supernova, SN 1987A. They found that the decay of the element nickel matched that of the established explosion, though there were signs of excessive light in the infrared. According to Benge, the excessive light could result from the destruction of dust. Because the decay of nickel at the beginning of the explosion matched up so well with SN 1987A, Benge thinks it is likely that the flaring came from a supernova. "This is indeed a supernova, but what has been identified previously to be the progenitor is not the progenitor at all," she said. So how did the dust-shrouded star everyone thought was responsible manage to wind up falsely accused? According to Benge, the star simply may have found itself in the wrong place at the wrong time. The source of SN 2008S could lie along the same line of sight but sit behind the dim star. When the progenitor exploded, its light drowned out the light from the star, much like a floodlight would overwhelm the light from a candle between it and the observer, he said. As the light from the supernova dimmed over time, the starlight became visible once again. Benge and her colleagues intend to continue investigating the strange supernova. They plan to examine how the dust around the now-cleared star would have affected observations of the explosion. "There are some very unusual processes going on here," Benge said.